At Go Andes Limited we understand the importance of our customers’ privacy and are committed to protecting and respecting your privacy. We work hard to keep your information safe and we want our holidays and services to be enjoyable for all. This policy covers our commitment to comply with the EU General Data Protection Regulation (GDPR) and other relevant data protection legislation. When we refer to “we”, “our” or “us” this means Go Andes Ltd. When we refer to “personal information” in this policy this means information that identifies a specific living individual such as full name, email address or other detail(s) that can be used on its own or with other data to identify them; in other words “personal data” as defined under the GDPR. Contacts, Enquiries and Brochure Requests: When you contact us, enquire with us or request a brochure from us we will collect personal information from you including your name, contact details (such as your address, email address and telephone number) and additional information about you such as your travel preferences. We use this information to be able to fulfil your request, for example to contact you if requested, to send you a brochure or to email you a tailor-made holiday itinerary to meet your requirements. Holiday Bookings: When you book with us we will ask you to provide additional personal information about you and all other passengers on the booking (such as family members, friends and children) including passport details, date of birth, emergency contact information such as your next of kin, credit card and bank account details, and relevant special requests including dietary requirements. We use this information in order to be able to fulfil our contract with you, to provide you with your holiday in line with your holiday itinerary, and to provide you the high standards of quality and service we strive to achieve which requires us to make bookings and reservations for you (such as flight tickets, entry permits and accommodation). We may also require some Sensitive Personal Data such as relevant medical conditions which we use to ensure your holiday is suitable to your requirements and to keep you safe during your holiday. Honeymoon Contribution Service: If you contact us to make a contribution to a honeymoon booking we will collect information from you including your name and payment details. We use this information in order to be able to take your honeymoon contribution payment. Social Media: If you contact us via social media (for example by liking one of our posts, messaging us directly, tagging an image etc) we may collect details about you including your name and your social media user name. We use this information so that we can respond to any comments or messages and to help us manage our social media presence. In order for us to be able to run our business effectively and provide you with the products and services you have requested and/or booked we share your personal information with our suppliers in South America (for example local businesses we partner with in our holiday destinations to be able to make accommodation reservations and tour arrangements), our suppliers in Europe and the UK (for example airlines and flight consolidators, and printing companies for letters and brochures), and any other third party where necessary to protect your rights and safety and / or the rights and safety of others. Where we share your personal data outside of the EEA the local laws in those regions may not provide you with the same legal protection as the EEA, and in these cases we have suitable arrangements in place to protect your data as required by applicable laws, for example we limit the personal information shared to only what is needed and have contract agreements with our suppliers. We will never sell your personal information to a third party for marketing purposes, and do not share personal information with any third party for them to use for the purpose of sending you their own marketing information. 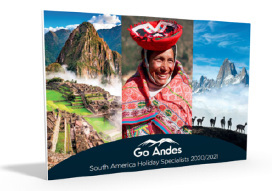 Go Andes are committed to protecting the security of your personal information from unauthorised access, use or disclosure as required by law. We limit the access to personal information and have inserted physical and technological barriers to protect your information. We keep personal information for an appropriate period of time and as long as necessary to fulfil the requests and booking you have made with us and to operate our business in accordance with our obligations. We do get repeat customers and or customers who re-contact us to book long after first contacting us, so we do store a minimal amount of information for longer periods to provide a high standard of customer service. We are also required to maintain some records for longer periods of time, for example for financial or tax purposes, so as our requirements can vary our retention periods can also vary. Performance of Contract (Article 6.1b of GDPR): We collect personal information so we can fulfil our contract with you, for example by providing your holiday arrangements for you. Legitimate Interest (Article 6.1f of GDPR): We have a legitimate interest to use the information you provide us so we are able to provide you with the best possible service, for example when you enquire with us we have a legitimate interest to make sure we help you choose the right holiday destination or to send you a brochure, and we have a legitimate interest to send you our newsletter informing you of relevant news or special offers. You always have the right to object to any direct marketing (see section 5, above). We reserve the right to make changes this policy from time to time. Where we make changes they will be updated on this page so we encourage you to check back frequently. If we make any significant changes we will endeavour to notify you by email.